How did this happen? What explains the current state of affairs that not only worries Americans but increasingly others around the world? Republicans blame Democrats, and Democrats blame Republicans. The long list of other suspects usually includes the influence of special interests, the role of big money, the decline of bipartisanship, the polarization of the American public, and, most recently, the proliferation of fake news. Many of these play a role. But we believe that these are symptoms, and not the underlying disease. The root cause of all those symptoms is found in the structure of the politics industry and the kind of competition it has created. And yes, our political system is a major industry, even though that is not the way most of us have thought of it. Most people think of politics as its own unique public institution governed by impartial laws dating back to the founders. Not so. It is, in fact, an industry—most of whose key players are private, gain-seeking organizations. The industry competes, just like other industries, to grow and to accumulate resources and influence for itself. The key players work to advance their self-interest, not necessarily the public interest. 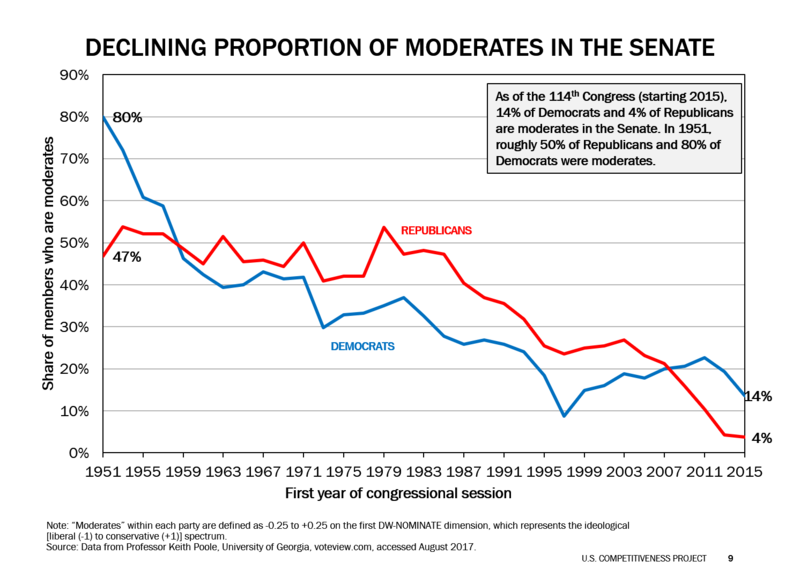 As our system evolved, the parties—and a larger political industrial complex that surrounds them—established and optimized a set of rules and practices that enhanced their power and diminished our democracy. These changes— often created behind closed doors and largely invisible to the average citizen—continue to take their toll at both the federal and the state levels. The result: America’s political system today would be unrecognizable to our founders. In fact, certain of our founders warned against political parties. John Adams, our second President, said, “There is nothing which I dread so much as a division of the republic into two great parties, each arranged under its leader, and concerting measures in opposition to each other.”2 Our founders— and most Americans today—would be shocked by the extent to which our democracy has been hijacked by the private and largely unaccountable organizations that constitute today’s political industrial complex. We want to be clear that the problem is not the existence of parties, per se. Parties serve an important role in democracy, and the fact that there are two major parties is not in itself the problem. The real problem is the nature of the political competition that the current parties have created, including their insulation from new competition that would better serve the public interest. To fix our political system, we must see politics as the major industry it has become, the major economic benefits it provides for its participants, and how today’s political competition is not serving the public interest. And we must understand the politics industry’s underlying structure to see the root causes of this dysfunctional competition and identify what to do about it. Our politics industry is a textbook example of a duopoly, an industry dominated by two players. Our two major parties, the Democrats and the Republicans, are the rivals at the center of the industry. Around them has arisen what we call the “political industrial complex,” an interconnected set of entities that support the duopoly.3 These include special interests, donors (particularly “big money”), pollsters, consultants, partisan think tanks, Super PACs, the media, lobbyists and the organizations they represent, and others. The political industrial complex is big business (see the sidebar “How Big Is the Political Industrial Complex?”). Virtually all the players in the political industrial complex are connected to one side of the duopoly or the other— the right or the left. This division of industry actors between the rivals is unusual and contributes greatly to the huge barriers protecting the duopoly from new competition. We know from studying other industries that it is not individual components of industry structure and competitive choices that drive results. It is how they all interact to drive the nature of competition. In this report, we use the lens of industry structure and competition to understand how the many moving parts of the political system come together—and how the myriad rules, arcane practices, and incentives have combined to produce today’s disappointing outcomes. Only by understanding the politics industry structure as a whole can we have any hope of proposing a strategy that would actually change the outcomes our political system delivers. The politics industry is different from virtually all other industries in the economy because the participants themselves control the rules of competition. There is no federal regulatory agency that acts truly independently from the interests of the duopoly and protects the public interest without partisan concerns. The only federal regulator, the Federal Election Commission (FEC), was created post-Watergate in 1975 to regulate campaign financing. Despite its designation as “independent,” typically the FEC is made up of three members from each major party, and party-line voting results in FEC deadlock.4 Effectively the Commission is used to protect the duopoly where they can agree—and used as a weapon of partisan warfare where they can’t. In addition, while every state has the theoretical ability to regulate many aspects of politics, in most cases regulatory decisions are biased toward the duopoly rather than the public interest. Overall, politics is a classic example of “regulatory capture.” Exacerbating the problem, the duopoly is not subject to antitrust laws. This reality helps explain how the industry’s power and influence has grown despite its continued divergence from the public interest. Free from regulation and oversight, the duopoly does exactly what one would fear: The rivals distort the rules of competition in their favor. The ability of the politics industry to set its own rules has allowed it to pervert some of the basic principles of what most of us think we know about representative democracy. To begin to understand how the industry works, here are three examples. Democratic Principle #1: The will of the people will prevail at the ballot box. Well, not always. Our political system is not as open as most Americans think it is. That is by design—based on specific rules created by and for the duopoly. Consider the case of Mike Castle. In 2009, Michael “Mike” Castle, arguably the most popular politician in Delaware, was the odds-on favorite to become the next senator from the state. Instead, he suffered a shocking defeat in his Republican primary. A highly partisan Tea Party candidate named Christine O’Donnell won with just 30,000 votes, in a state of 1 million people, because of the typically low voter turnout in primaries. A logical next step would have been for Castle to then run as an independent in the general election—but he could not. The problem was that Delaware has a sore loser law. If candidates run in a party primary and lose, they cannot be on the general election ballot in November regardless of their popularity with voters.11 A law created to protect the parties from competition kept Delaware voters from being able to choose the candidate whom they likely would have wanted as their senator. When parties control access to the general election ballot, one of the pillars of democracy is undermined. As any business person knows, this kind of anti- competitive rule would be illegal in most industries. Democratic Principle #2: One person, one vote. For example, consider a state that’s controlled by the Democrats. When redistricting takes place, the party analyzes huge amounts of voter data and uses the analysis to draw district lines to create the greatest possible number of districts that are safe for Democrats. This means “packing” Republican voters into as few districts as possible to “waste” their votes, or “cracking” them into different districts where they will be outnumbered by Democrats. In either case, the result is to dramatically reduce the likelihood that Republican votes have any impact whatsoever on election results. 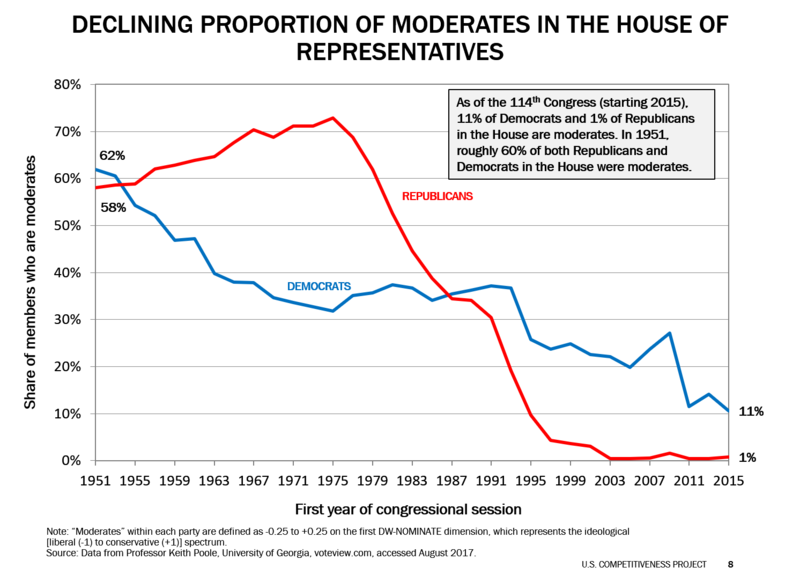 Historically, both parties have been about equally guilty of gerrymandering. Gerrymandering reduces competition by creating “safe seats” for one party, which means that the primary winner of the party for whom the district was made “safe” is virtually guaranteed to win the general election. 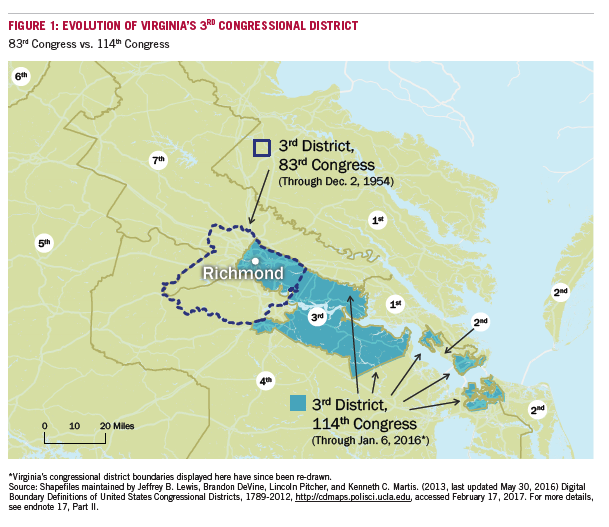 The effect of this reduction in competition is to reduce the accountability of elected officials to citizens: Representatives from gerrymandered districts answer primarily to primary voters in their own party. Democratic Principle #3: The majority rules in legislating. Well, not always. The duopoly has infiltrated day-to- day legislating through the establishment of myriad rules and practices. The “Hastert Rule,” for example, is a particularly egregious example of party control taking precedence over the legislature’s ability to work collectively—even when constituents want it. The Hastert Rule has become a well-accepted practice of the Speaker of the House: The Speaker will not allow a floor vote on a bill unless a majority of the majority party (i.e., the Speaker’s party) supports the bill—even if the majority of the entire House would vote to pass it. Unless Speakers ignore this practice (which they do from time to time, but rarely), even legislation supported by a majority of the country or by a majority of the House has no chance of passing. For example, in 2013, the U.S. government shut down from October 1 to October 16. The shutdown could have been averted or ended earlier if then-Speaker John Boehner had allowed a floor vote on legislation passed by the Senate and supported by a majority of the House (i.e., virtually all Democrats and a minority of Republicans). The shutdown ended only when the Speaker broke with his party—and broke the Hastert Rule—to allow the vote. Effectively, this “made up” rule cements majority party control in a legislature that is supposed to represent all U.S. citizens, and it allowed a small number of extreme partisans to hold the country hostage for 16 days in a shutdown. IT'S IMPORTANT TO RECOGNIZE THAT MUCH OF WHAT CONSTITUTES TODAY'S POLITICAL SYSTEM HAS NO BASIS IN THE CONSTITUTION. HOW BIG IS THE POLITICAL INDUSTRIAL COMPLEX? It is difficult to determine the true size of the politics industry, and how the money is spent, because of a lack of transparency. What is clear, however, is that the political industrial complex is itself a major industry, and direct political spending is only part of the picture. Actual spending is likely to be many billions of dollars higher due to substantial unreported spending, including so called “shadow lobbying” and below reporting threshold expenditures.6 At least 19,000 jobs in 2016 can be directly attributed to lobbyists, campaign consultants and campaign workers on payroll, and staff at partisan or partisan leaning think tanks. We could also identify over 1,000 organizations with major consulting contracts involving campaigns.7,8 Politics is clearly big business. Politics is also big business for the media. Election related political advertising and advertising on shows heavily focused on politics represent a meaningful percentage of overall media advertising revenue in election years. At least $1.5 billion in non-political advertising is flowing to the media to support just major television shows covering politics and elections.9 Major advertising is flowing to radio shows and other political media, but data are unavailable. However, direct political spending is only the proverbial tip of the iceberg. The political industrial complex also exerts a major influence over the largest single industry of all, the combined federal, state, and local governments. The federal government alone spent about $3.9 trillion in fiscal year 2016,10 and the politics industry plays an important role in determining where these trillions in government spending go. Politics also has a huge effect on the economy overall through its influence on virtually all policies and regulations affecting business. Regulation and taxation alone involve trillions of dollars in benefit and cost to corporations, while affecting industry competition. Given this huge economic impact, it is little surprise that businesses and other organizations seek to influence public policies through lobbying, which takes various forms. There is a substantial literature that finds that, in the current system, lobbying spending, earns a very high return on investment. REDISTRICTING HAS BECOME A PROCESS WHEREBY POLITICIANS CHOOSE THEIR VOTERS INSTEAD OF VOTERS CHOOSING THEIR POLITICIANS. As these examples so vividly illustrate the duopoly has used its power to set the rules of engagement in both elections and governing to enhance its own self-interest and power, at the expense of the public interest. 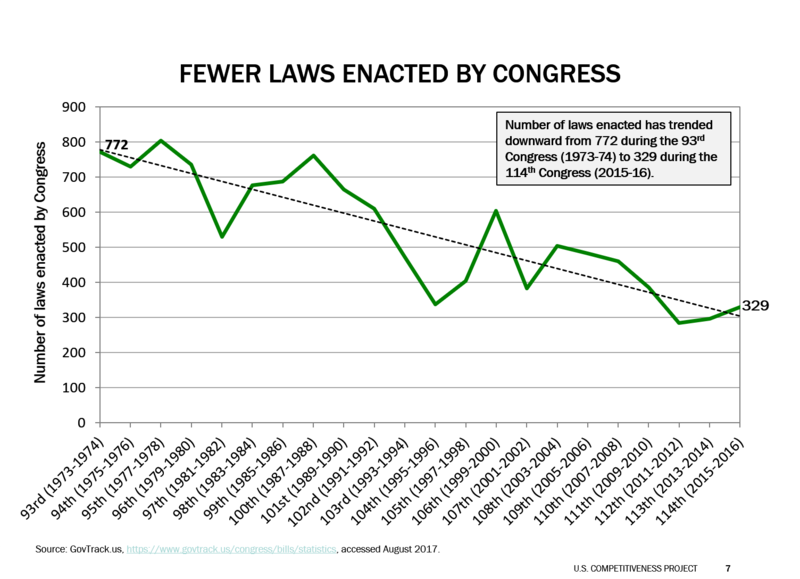 These biased rules and practices have many competitive consequences including a decline in legislation passed,19 the near extinction of moderates in the Senate and the House, and declining bipartisan support for laws enacted (see Figures 2, 3, and 4). While many individual industry practices such as these are familiar to political insiders, the understanding of their collective implications has been hazy at best, and has become our central challenge—and opportunity. We can recapture our democracy, but first we must understand how competition in the politics industry actually works. We will turn to this in the next two Parts. Note that most of our analysis in this report will focus primarily on the federal government; however, much of the industry structure and practices also apply at the state level. But truly reinvigorating our democracy will require more than just analysis. We must be willing, as citizens, to put that understanding to work. As political activist Doris Haddock said, “Democracy is not something we have; it’s something we do.”20 We will put forward a strategy to reform our political system in the last section, Part VI.